The gaping holes in the tan-brick facade of the Verizon Building are still open to the ground zero void. The blasted steelwork is jacked up like a Rube Goldberg contraption. Only four tortured pieces of the 72-foot ornamental entranceway bronze work now exist. Such are the wounds inflicted by the crushing debris from not one, but three, neighboring buildings: the north and south towers of the World Trade Center, and 7 World Trade Center, which pancaked next door. But the Verizon Building is very much alive. Enduring a daily chaos of cement mixers and the sparks from welders' arcs, the building at 140 West Street is again sending out dial tones to 34,000 customers. It is putting stockbrokers online. It is generating revenue. It is doing so without the 1,700 office workers who have been relocated to other buildings. Aside from communications equipment, the Verizon Building is populated only by a temporary staff of construction engineers and the 250 hard hats who are toiling there to bring it all back. This seat-of-the-pants reconstruction of the landmark 32-story building could use a metaphor, and Dominic P. Veltri, Verizon's New York manager for design and construction, is ready to supply one. "What we're doing here is engineering on the fly," he said. "We're changing a flat tire on a bus going down the highway at 60 miles an hour." Some bus. For four decades, the landmark 1926 Art Deco building at the corner of Vesey Street was the headquarters of the New York Telephone Company. It is currently the most visible symbol of reconstruction efforts at ground zero. For thousands of tourists gawking at the building, the grievous damage, and the army of construction workers swarming to mend it, are a sobering reminder not only of the horrors of the terrorist attack but also of the heroic efforts to clear the rubble and bring back Lower Manhattan. Beyond this, the construction effort is a boost for a company that was besieged by service-restoration complaints after the terrorist attack, and has subsequently battled the Communications Workers of America in an eye-blackening advertising war over job security. That culminated when Verizon, citing cellular and cable competition and federal regulatory strictures, laid off more than 2,700 workers in New York and New Jersey last month, generating a Christmas blizzard of news media reports about the plight of the newly unemployed. To date, the reconstruction effort has not been affected by the fight with the union, although if picket lines materialize during contract negotiations next August, some construction workers may not cross. The repopulation of 140 West Street with some office workers is now scheduled to begin at the end of 2003, but the rebuilding could continue for years. So far, $70 million has been spent to stabilize the building, and the restoration is expected to cost at least $140 million more, only part of the $1.4 billion that Verizon is spending downtown to restore equipment and cables. Since the day the building opened in 1926, it has been a beehive of both administrative and technical activity, and its design was considerably more than functional: it was intended to establish a presence, given the building's role as administrative headquarters and central office. Nevertheless, according to George Famulare, Verizon's manager of corporate real estate, "the building is a tank." Built with reinforced concrete and steel, its floors can hold 250 to 300 pounds per square foot, constructed to support the giant electromechanical switching assemblies that were replaced long ago by electronic alternatives. If that sturdiness accounted for its survival, the subsequent efforts to protect and restore 140 West Street have been nothing short of Homeric. Verizon lost two of its technicians, who were working above the crash zones, in the World Trade Center attack. None died in the Verizon Building. Mr. Famulare supervised the evacuation after seeing people jumping from the towers. He found himself trapped under his desk after the ceiling fell during the collapse of the south tower. Eventually he escaped through the cloud of ash and dust looking like "a white powdered doughnut," he recalls. Then he stayed to shut down crucial equipment. During the collapses, steel projectiles from the towers hit the Verizon building, sliced the mains and left water cascading into the building's five subbasements, filling the lowermost vaults like a swimming pool. A javelin of steel actually speared through the sidewalk concrete and lodged in the basement. The building's fuel oil tanks were submerged in water, then burst. Up in the topmost subbasement, a pool of shin-deep water made unusable the miles of snaking phone cables (black for copper, orange for fiber optics) in the 250-foot-long, 60-foot-wide cable vault. At 10:21 p.m., the building's backup batteries ran out of power and the last call went through the switching equipment. Below, Subbasement B held much of the telephone company's historical records, memorabilia and antique equipment, which was damaged by the flood. It took two months to pump out 12 million gallons of water mixed with 40,000 gallons of petroleum. The building controlled 300,000 dial tone lines — 35,000 of them in the twin towers themselves — in a several-blocks-wide swath of Lower Manhattan stretching from the Hudson to the East River, affecting 20,000 residences and 14,000 businesses including the New York Stock Exchange. Also down and out were 4.5 million data circuits, including high-speed Internet lines and connections to brokerages, Lotto terminals and A.T.M.'s. "We deal with problems all the time — hurricanes, floods, fires — but this was an effort that had no parallel," said David A. Rosenzweig, vice president for northeast network operations. "It will never compare with what the police and firemen did, but our war was to restore service. For us, there was nothing else in the world." As the salvage work began, all of the damaged phone systems were bypassed. And so, waterlogged, crushed phone lines in the cable vault were cut with a chain saw. New cables were spliced in, then snaked out to the sidewalks; soon 140 West Street was festooned with above-ground replacement cables. Upstairs in the formerly sacrosanct, climate-controlled clean rooms that housed hundreds of telephone cabinets bearing computer switching cards, the walls had gone unimaginably missing; firefighters established their hoses there to fight the raging fire in 7 World Trade Center. Some of the once-cosseted switching cabinets were actually suspended in midair, open to the elements, hanging from the building only by their power cables. Service began to be restored three days after the terrorist attack. Ultimately, the workers brought back not just the infrastructure's "pots" but also the "pans": communications jargon for "plain old telephone service" and "pretty amazing new stuff," including high-speed T1 and T3 lines, multiplex connections (from electric to fiber optics) and digital cross-connect systems. "It was like the Frankenstein monster," Mr. Veltri said. "Slowly, it came back to life." Ultimately, workers installed 45 miles of fiber optic cable and 22 miles of copper cable. By the end of 2001, service was mostly restored, "though there were horror stories where people had problems into the next year," Mr. Rosenzweig said. Now, much of the 14 floors of damage to the south-facing wall has been refaced with custom-fabricated brick from Stone Creek, Ohio. Gone is the 7 World Trade Center debris that was stacked up to Verizon's fifth floor. Seven of the building's 23 elevators have been brought back. All 1,800 windows are being replaced. The restoration will ultimately require 520,000 facade bricks, 22,500 cinder blocks and 93 tons of structural steel. 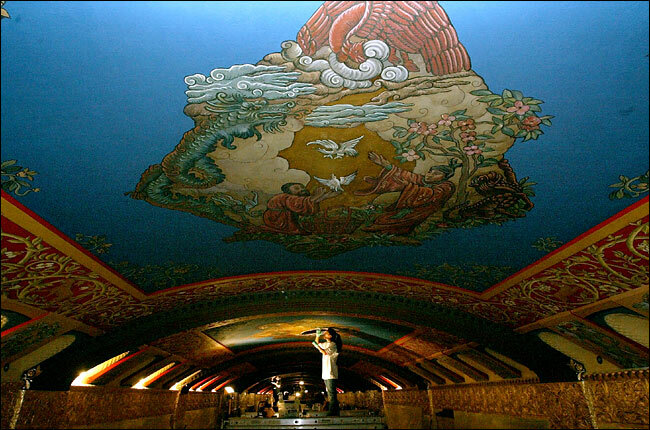 In the lobby, 15 linen-backed ceiling murals — a flapper-era celebration of the history of communications also declared a landmark — were damaged by burst water mains and firefighting efforts. Four need extensive repair; all need cleaning. Some of the most challenging restoration is proceeding far from the building. In a three-story former tin-ceiling plant in Brooklyn, a bronze foundry is using a 5,000-year-old casting procedure — the lost-wax method — to painstakingly restore the building's intricate bronze detailing. There was damage to bronze at the main entrance on Washington Street, as well as to the decorations above the blown-out former retail storefronts, with their hand-rolled textured glass. A vast fantastical bronze bas-relief of whales, pelicans and sea horses is being recast. "The molding process is sensitive enough to reproduce a fingerprint," said Bill Gold, president of the Excalibur Bronze Foundry, which also restored the bronze work in such landmarks as the main reading room of the New York Public Library. Only four twisted chunks of the frieze — heated and bent in the collapse of "seven," as ground-zero hard hats call 7 World Trade Center — survived. The remainder is being copied from the building's undamaged western frieze. As the effort proceeds, new workers will have to be trained in the art of bronze restoration, but already the veterans take special pride in their labor. The job "has no precedent," said a welder at the foundry, Milton Osborne. But though he is helping to rebuild 140 West Street, he has never gone to see the building "because," he said, "of the emotion of it." Good article. *Nice to see the area slowly becoming the Phoenix! Nice article. As a telecom worker, I had been in the Verizon *building many times. In the Bell System days, we referred to it simply as "West St." That building, 32 Avenue of the Americas, and 60 Hudson St represent the history of telecommunications in NYC. A good example of the 1916 set-back law. There was talk after 9/11 that the building would have to come down. Verizon took over the city owned lot at Warren and Greenwich, and brought in mobile switching equipment. They recently vacated the lot, so things must be pretty good inside. 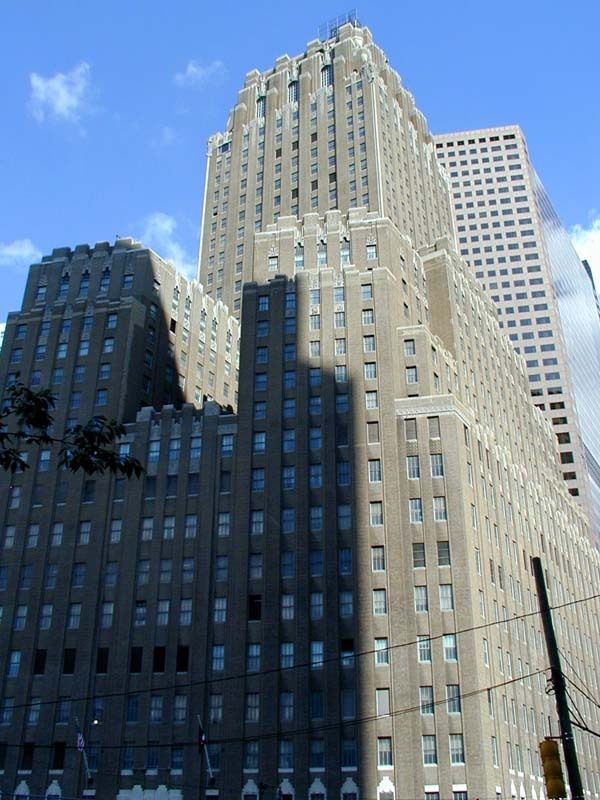 The Verizon Building is a premier example of art deco architecture. *Such a grand old building; even Le Corbusier said that he liked it. It's not a bad building after all. In fact The Verizon Building is an architecturally excellent and structurally sound building. Its strong integrity saved all these phone lines from collapsing and causing even more economic damage. All it needs now is a new set of big twin brothers. It's not a bad building after all. As a big fan of that building, I'm a little shocked. Forgive me for saying this, but I have a soft spot for the International style towers as I do for the Art-Deco towers. The Verizon building is a decorative and structurally strong building. It should have been built 25 floors taller though. Barclay-Vesey Building and 7 WTC on 19 August 2000. I love how the base of the building is torqued like the plot, yet the tower itself is a perfect square that is parallel to Barclay and Vesey; however, the tower is the only element which looks torqued. *It's certainly an interesting optical illusion. Thanks people, very interesting and informative article and video. *I've always loved this building but was totally ignorant of the amazing infrastructure behind those magnificent Art Deco walls. So long as we're talking about Ground Zero buildings, I read a few day ago in a New York Times mini-article that some developer is going to buy 90 West Street to convert it into apartments. At the Verizon Building in Lower Manhattan, repairs to the ceiling murals have been painstaking. It's not quite the Sistine Chapel, but New York now has its own newly restored ceiling murals, in the lobby of the Verizon Building. After two years of effort, a team of 30 conservators, technicians and artists is nearly finished refurbishing the building's gilt and gloriously polychromed 210-foot-long landmarked lobby ceiling, which suffered severe damage on Sept. 11, 2001. The complex, labor-intensive restoration at the Verizon Building, at 140 West Street, has been similar in many respects to the restoration at the Vatican, entailing technical analysis, historical research, correction of previous overpainting and formidable efforts to salvage damaged plaster. But there is one considerable difference: the World Trade Center did not collapse next door to the Sistine Chapel. "I'm sure that the Sistine Chapel paintings were dirty, but they didn't have to deal with the explosive force of 9/11, and the filth that came pouring into that poor lobby," said Peg Breen, president of the New York Landmarks Conservancy, which has been monitoring the work. "Verizon has made heroic efforts to restore these murals." Verizon, still in negotiation with its insurers, declined to reveal the reconstruction bill, but preservationists estimate the cost at $2 million. The scaffolding will come down next month and, after more lobby reconstruction, the murals will be unveiled next year. "At first, we thought we might be able to give the ceiling a thorough cleaning, then restore the paint, but we had no idea what we were dealing with," said Dominic P. Veltri, Verizon's manager for real estate design and construction. "We discovered many severe underlying problems." On Sept. 11, 2001, the 32-story Verizon Building, constructed in 1926, was crushed by the north and south towers of the World Trade Center as well as 7 World Trade Center, which pancaked next door. But even before 2001, the passage of three-fourths of a century had taken a toll on the lobby of the building, the former administrative headquarters of the New York Telephone Company. The murals were faded, begrimed and stained. Flaking paint had been retouched in the 1980's, said Jeffrey Greene, president of EverGreene Painting Studios, to which Verizon entrusted the restoration, "but the overpainting was incompatible, the color match was out of the can, and they used acrylic house paint over the original oils." Damage was rapidly accelerated by the trade-center collapses, when the dust that caked the murals was baked by intense heat from the fires. There was water damage from the 21 days it took to douse the raging blazes in building 7. Then for months, the lobby was open to the elements. And so, restorers had to vacuum the images carefully, sponge them to remove dust, then wash them delicately with cotton swabs. Technicians used hypodermic needles to inject acrylic resin and ethyl cellulose glue into crevices to reattach plaster and paint to the ceiling "square inch by square inch," said Gillian Randell, chief conservator of EverGreene. Separately, in the EverGreene studio in Manhattan, workers painted 509 linear feet of floral decorative panels, to replace the originals. Then the ceiling was gilt anew. Not that anyone could confuse the 12-foot-by-11-foot panels of the Verizon mural with the work of Michelangelo, but the restorers did happen to discover the original 1926 signature of the artist — Hugo R. B. Newman — on one of the murals. The 12 ceiling tableaux depict not the creation of man, as on the Sistine ceiling, but celebrate the history of human communication, offering everything from an Egyptian megaphone to West African drums. The artistic culmination, of course, is the great god of the telephone, as embodied by a painted classic "candlestick" receiver, cutting-edge in 1926. Helen Rocos, a 53-year-old conservator working on a 20-foot-wide scaffolding, said that restorers were aware that "this is a very special job." No, she hasn't been hectored by Pope Julius II, as Michelangelo was on his scaffolding, but her work has been applauded by hard-hat passers-by. "The ceiling has a symbolic emotional meaning to all of us," she said, "because it's a visual reminder of what survived." It never looked this good.